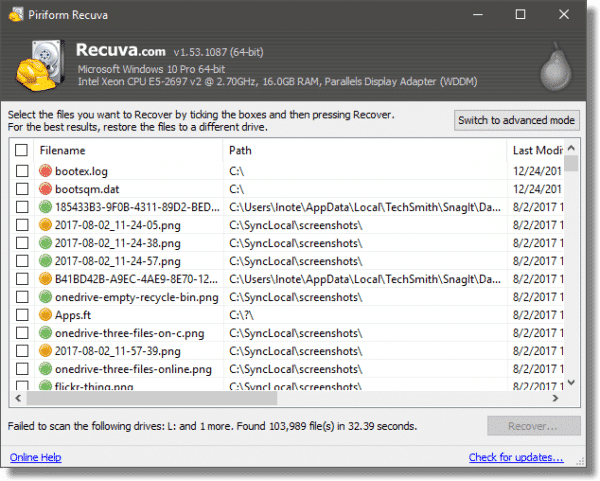 Recuva: a Free, Easy Undelete and File Recovery Tool - Ask Leo! 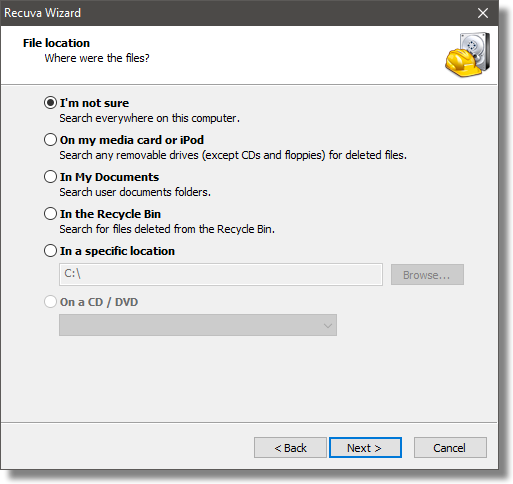 Even with the Recycle Bin to protect you, it's not uncommon to need to recover files that have been "permanently" deleted. Recuva gives you a chance. For the longest time, I didn’t have a file undelete utility — not because there aren’t good ones, but because I never really got comfortable with any of the ones I tried. I just wasn’t comfortable recommending any. Then I discovered Recuva. It’s free, easy to use, from the same people that bring you CCleaner, and it’s what I use myself when the need arises. Normally, when you delete a file in Windows File Explorer, it isn’t really deleted, but moved to the Recycle Bin.1 In most other cases, Windows “permanently” deletes the file. When you permanently delete a file, the contents of that file are not necessarily lost. Instead, the space it previously occupied on the hard drive is marked as “free”, making it available for use the next time data is written to the disk. Only when that happens are the previous contents of that space — the file you “permanently” deleted — overwritten. As long as that doesn’t happen, there’s a chance you can recover the file. Unfortunately, it’s rarely black and white. For example, if you delete a large file, and then write a small file, only portions of the large file might be overwritten. 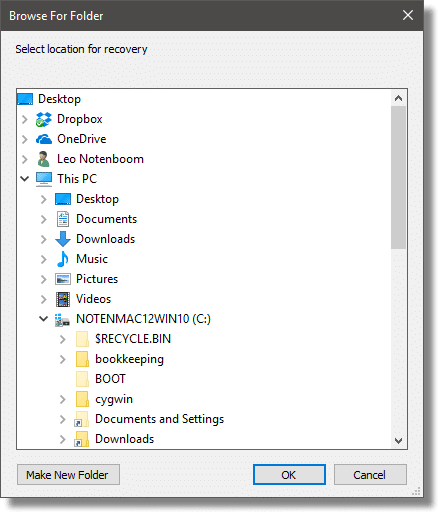 While you can no longer recover the entire deleted file, you may be able recover part of it. When you delete folders, things get even more complex, because it’s the information kept by the folder that identifies just where all those files and parts of files are. This is where Recuva comes in. It scans the space marked as “free”, as well as the overhead information on the hard disk, to identify files or parts of files that might be recoverable, and allows you to do so. 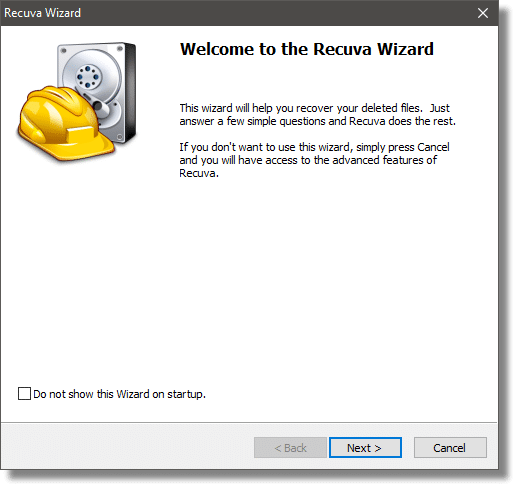 By default, Recuva starts with a Wizard. 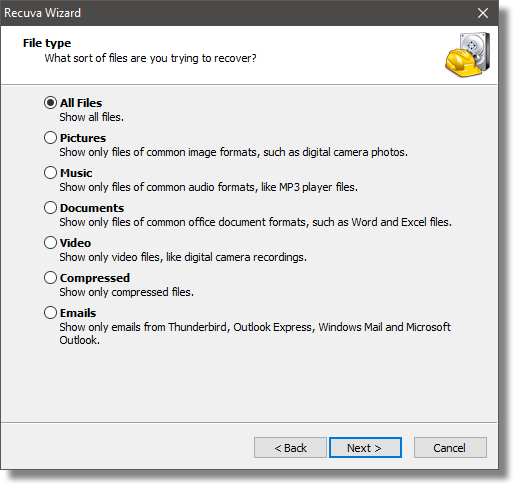 Click Next, and you’ll be asked what file types Recuva should look for. If you know what type of file you’re looking for, you can select it here, or just leave the default as “All Files”. Click Next, and you’ll be asked which disks or folders Recuva should scan. If you know where to look, select it; otherwise, leave the default as “I’m not sure” to let Recuva look everywhere. Click Next, and Recuva will confirm that it’s ready to start looking for whatever it might be able to recover. The option “Enable Deep Scan” can be left unchecked initially. 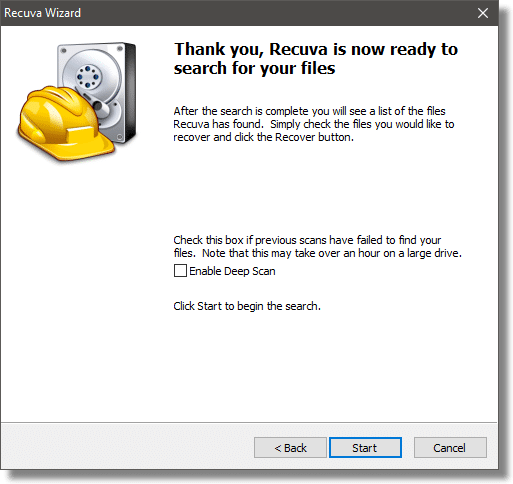 File recovery can be very complex, but Recuva’s initial pass (without Deep Scan enabled) looks for the most common ways files can be successfully recovered. As the text in the message indicates, if you can’t find what you’re looking for quickly, you can return and select “Enable Deep Scan” for a more thorough but time-consuming attempt. Click Start and the scan begins. After some time, Recuva will present you with a list of what it has found. There’s a lot of information here, but the single most important — besides the filename and path that identifies the file you’re examining — is the red/amber/green indicator at the beginning of each. Green: file can likely be completely recovered. Amber: file may be recovered, but is likely to have damage or be only partially recoverable. Red: file is unlikely to be recoverable. There’s still uncertainty in each of those options, simply because the disk is probably still in use and file systems are complex. Be sure to scroll the list horizontally; you’ll find additional useful columns of information. To attempt to recover a file, check the box in front of file you want in the list, and click on Recover. You’ll then be asked for a destination to which the recovered file should be placed. Ideally, that destination would be on a different drive. Since any writing to the disk being examined has the potential to overwrite the very data we’re attempting to recover, it’s best to write elsewhere if you can. If you can’t, you’ll be warned. When do you need to “Recuva”? Accidentally deleting a file permanently, and not having a backup some other way. If a file is deleted into the Recycle Bin, look there first, of course. If you can restore it from there, you don’t need Recuva. If you can restore the file from a backup, you don’t need Recuva. But if the only copy of a file was permanently deleted — explicitly or otherwise — or it’s just missing, scanning with Recuva can sometimes locate and recover the file before it’s overwritten. Disk corruption. Sometimes, when a disk fails or software crashes, files go missing. Running CHKDSK can fix underlying problems, but can also cause “collateral damage” in the form of missing files. 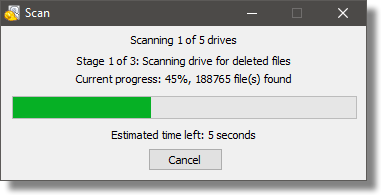 Recuva can scan for what might still be salvageable. There are two additional scenarios worth being aware of. It’s rare, but thieves can use utilities like Recuva to recover files you’ve deleted. The only prevention is to use some form of secure delete or free space wipe regularly. Computer forensics is frequently all about data recovery, and knowledgeable law enforcement staff sometimes use Recuva, or similar tools, to recover information thought to be deleted. The moment you believe you might need to recover a file using Recuva, stop using that computer, or at least use it as little as is possible. The problem is a simple one: the more you write to the disk, the more deleted information will be overwritten, lowering the chances of recovering deleted or damaged files. Even leaving the machine running idle can still cause problems, as Windows itself also frequently writes to the hard disk. Unfortunately, rebooting is even worse. The best advice I can offer is to install Recuva before you need it, and use it without delay when you need to recover something. For that all-too-common-case of trying to recover a deleted file, Recuva is now my choice. I Deleted a File by Mistake, Can I Get It Back? - It is sometimes possible to recover a file deleted by accident. Stop using the disk, check your Recycle Bin, and perhaps pull out an undelete utility. Why Can’t I Undelete these Files? - Deleting a file doesn't necessarily remove the data from disk. It then becomes a race to recover it before it's overwritten by something else. Does deleting things really delete things? - Deleting items on your computer usually doesn't wipe them clean. That's an extra step. Why Aren’t Deleted Files Always Moved into the Recycle Bin? - The Recycle Bin is a handy safety net when you accidentally delete something. However, the Recycle Bin isn't always there. 1: Unless the file is too large, in which case you’ll get a warning. 2: Everything shown was completed with the free version of Recuva. It’s really all most people need. If you expect to do this a lot, or want to show your support to the vendor, you can always purchase the Pro edition later. One problem — which I just discovered — is that when you install Recuva it may overwrite the files you want to recover! Better to install it now in case you need it in the future. I endorse this recommendation: bought a “refurb” 1 TB external HD and just out of curiosity ran Recuva on it. Though it was “empty” when opened with “My Computer, Folders” I found about 20 GB of music files that the previous owner had failed to securely erase. (The music was not to my taste, and she/he didn’t leave any personal files or information on the HDD!) A lesson worth learning as Leo has frequently made: ERASE your old drives before disposing or returning them. I have used this program for some time now, and it can very well be a lifesaver. On the other hand, you can use this program to securely delete files as well. It can overwrite info up to 35 times (the Guttman method). So if you want to sell or donate your computer or simply cover your tracks, Recuva is a fine program. It comes from the family that includes Recuva, CCleaner and Defraggler, and I have and use all three of them. I just went to the site, and it still looks free to me. They ask for a donation, but that’s not required. Not sure why you needed to pay $20. Did you get it from the official site? Downloading the portable version can also overwrite some files. Best to download the portable version on another computer and run it from a USB drive. 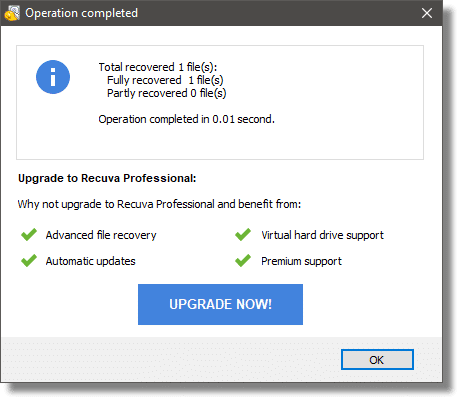 Did You know that you can also Make the recovered files found via RECUVA – – Completely and Absolutely UN-Recoverable at the same time?!? Check it out as it is part of the second phase of the recovery process! My question is, Can Recuva be downloaded unto a disc? If so, what steps are needed? I would like to be able to use on multiple computers(laptop, desk) without taking up hard drive space. Check the Piriform site. They offer a portable version for installing on USB drives and the like. I think I know what exactly he means. To me personally it’s quite obvious that those ‘colourful pictures’ on your website are the ads, but I see how one can mistake them for something else as those ads usually have a relevant subject to what is being discussed in your article #and that’s the whole point of those targeted ads – we simply need to be aware of those sorts of things#. Also, you yourself told your readers #but in a different article# that there are some ads on your website, and I’ve noticed that one of them that appears when opening this particular #”Recuva”# article is advertising so called “Undeleter”. I think the guy clicked on that ad #which, unfortunately, is deception# thinking that it was the link to the discussed “Recuva”. Well, that’s a very common mistake these days, isn’t it? But “Recuva” doesn’t sound anything like “Undeleter”, does it? Although it’s true that quite often it’s not clear enough where exactly to click in order to start the download of advertised software, I recall that in one of your articles you warn your readers when pointing out at the external website ‘to be careful on what they click’ #I unfortunately can’t remember which article it was#. Also, I’ve noticed that you always underline the actual name of the software being discussed which gives the link #when available# to their website. But I think the guy is not aware of that either. If you’d read the article carefully, you would seen that it’s not Recuva’s fault that it could only recover 50% of your data. That unrecoverable data was probably overwritten before you could run Recuva. I lost my data of drive D by mistake. Can i recover it ? I read about recuva, but i dont know how to get it? I used killdisk on my hard drive, can i recover the files with recuva ? Or am i screwed ? A disk which is cleaned by KillDisk is wiped beyond recovery.